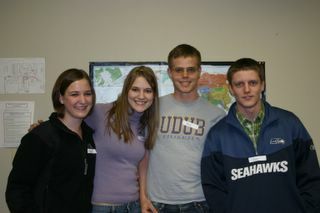 World Deputation 2010: Team India... check'n in! Joel is just now getting over being really sick, he has spent the last two days bed-ridden with diahrea so I will write a short update on what's going on in India. India has been quite the experience so far. Bangalore has 7 million people and we feel like we've seen all 7 million of them already! Cows & dogs run wild and the streets are complete chaos. We are starting to settle into our weekday routine of helping out with the Asha Kiran special needs school. The children are an absolute joy to work with. Ashley is working in the nursery, Meadow is teaching english, I am in the computer lab and Joel will be teaching business and math when he recovers. Joel is the first of us to get sick, which is pretty ironic since he was the most concerned about not getting sick. This weekend we will be sleeping at the school to help with an older kids camp and we will be leading activities on Sunday morning. Prem and Rita James are amazing hosts and both are very wise in the Christian faith and in the many different religions of India. We have already learned so much from them during our night-time discussions. The team would appreciate prayers that Joel would continue to recover and that he would be able to start teaching, that the weekend camp at the school would go well, and prayers that Christ's message would be heard throughout the one billion populace of India. Joel-It's a bummer to hear that you're sick, but know my prayers are with you. Get well so you can get those kids into Apprentice-like shape.